See YouTube videos of how these great caps are used here, pictures throughout this site. Our LED Lighted Cap illuminates what you’re looking at without having to hold a flashlight or put on a bulky headlamp. These LED Lighted Hats use patent pending C.U.B. (Concealed Under Brim) Technology™. The new 4 LED Stealth Powercap offers the most discreet and advanced LED cap light ever. Combining 2 low beam LED's for up-close tasks and 2 high beam ultra bright LED's for long distance. This Lighting Technology means you now have one Lighted Cap that can provide you with distance lighting for Running, Walking, Biking, etc., while also satisfying your need for close up lighting for Reading, Hobbies, Home/Auto Repair, Grilling, etc. 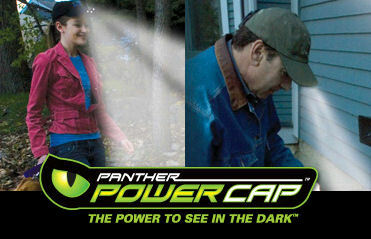 You will find Panther Vision™ lighted hats are perfect for outdoor activities like hunting, camping and fishing and they are also indispensable for emergencies like power outages and automobile breakdowns. With just a quick click of the on/off switch hidden on the underside of the brim, the light from Panther Vision’s LED Lighted Caps illuminates an area from reading distance all the way out to 50 feet. And since the LED’s are built right into and under the brim, they provide Lights Where You Look™ for the ultimate in hands-free lighting around the house or out and about.